Energy efficiency incentives from Entergy Arkansas are helping Arkansas State University-Beebe’s campuses save money by reducing the amount of electricity required for operation. 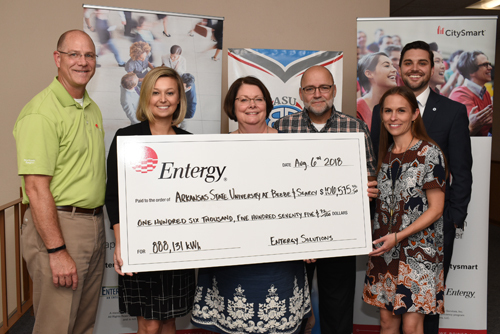 Entergy Arkansas and Johnson Controls presented a project rebate check to officials at ASU-Beebe on Aug. 6, 2018, as part of an energy efficiency project that replaced all the lighting and many HVAC units at the college's three campuses in Beebe, Searcy and Heber Springs. The upgrades, according to Entergy, have already saved 888,131 kilowatt hours of electricity for the college in just six months. Pictured (L-R) Flave Carpenter, customer service representative for Entergy's North-Central Region; Charlette Moore, associate vice-chancellor of Finance at ASU-Beebe; Dr. Jennifer Methvin, chancellor of ASU-Beebe; Roger Moore, vice-chancellor of Finance & Administration at ASU-Beebe; Heather Hendrickson from the Energy Efficiencies office of Entergy, Inc. and Alex Ray with Johnson Controls Company. Participation in Entergy Arkansas’ CitySmart Program resulted in a $106,575.72 incentive check, which helped the school purchase and install energy-efficient LED lights throughout the Beebe, Searcy and Heber Springs campuses. ASU-Beebe also implemented efficiencies in their HVAC equipment and controls that will earn them additional incentives through the CitySmart program. Entergy Arkansas provides electricity to approximately 700,000 customers in 63 counties. Entergy Arkansas is a subsidiary of Entergy Corporation, an integrated energy company engaged primarily in electric power production and retail distribution operations. Entergy delivers electricity to 2.8 million utility customers in Arkansas, Louisiana, Mississippi and Texas. Entergy has annual revenues of more than $12 billion and approximately 13,000 employees.